We know that brewed coffee has still by far the biggest market proportion of all consumed coffees worldwide. So, looking into a market opportunity of opening the minds of existing consumers for new or speciality coffees and new flavours, new brewing methods, and thereby endeavour new “taste explosions” with creating more value and recognition for coffee could be a strategy and a fairly easy win through a brewing bar. Are some specialized coffee drinkers, that were successfully introduced to “our world of espresso”, a bit tired of cappuccino et al and are now looking maybe for the next challenge or field of exploration in coffee? Coffee brewing can be definitely be an option for them to look into it. As coffee is a substantial part of my life, I was happy to use some hours attending the HOST fair in Milano to walk through the halls looking for some new products. I am sure you may say, that there were many other ground breaking products, worth to mention here, but in relation to the above described topic I found the Top Brewer by scanomat to be one of the few products that stood out for me. Scanomat´s traditional business are fully automated coffee brewers. Using this obvious core competence, they have now released a new product category in the top brewers. We know top brewers for some time already, but scanomat demonstrated a very, very stylish, but still highly functional top brewer serving great coffee and espresso. I am honest. Passing by the stand at the HOST I was caught by the “water-tap-like” design and just curious asking: “Can this “tap” make coffee?” Was my snobbish question. “Sure! You want to try?” was the reply. Being a Barista and bringing in some coffee expertise from various angles, it is usually very hard to convince me. Kim Vibe Petersen and Simon Bracken served us 2 espresso and 2 coffees from the same machine. Both, espresso and coffee, were extremely good. Nice crema, good colour, and a balanced taste. The coffee was a smart selection of a typical Nordic blend, that suited the machine very well. What was fascinating for me and where can I see it coming through in the market? Scanomat not just focused on creating something that looks good and stylish. Nor did they obviously only focus on the coffee brewing part. They have used, what they can best and created a new category, that serves taste and style. The machine and its features is very well thought through and innovative. Scanomat obviously knows, that the end product that comes out of it, will determine its success of Top Brewer. It produces in a very stylish way good coffee, which is altogether a great thing. Ok, steaming the milk can still be a bit improved, but it is capable of creating a nice 3 layer latte macchiato, but they will fix this. I am sure. To all IPhone/IPad users: There is also an app! So you can make your coffee selection straight from your IPhone/IPad. That was another “WOW” and my husband loved that part too, believe me. I can think of a couple of gastronomy ideas, where this system can be integrated. I am aware of coffee makers, who could utilize that system. In a market context of further scaling the brewing topic into the market, top brewer can be in the centre of it in specific market segments and a driving force. 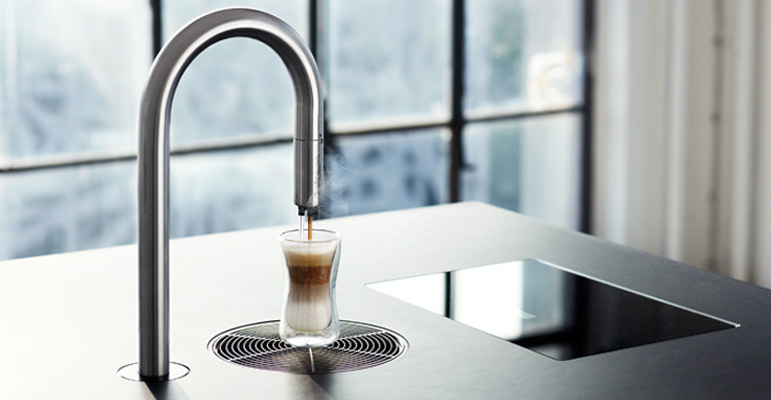 Top Brewer is a very innovative, stylish and high quality product. Its design and features are really top. My impression on the brewing capabilities is positive, but of course I would love to test the top brewer on other coffees / espresso. I see its potential in the professional gastronomy as well as in the private consumer areas, but it may require more product diversification to serve both gastronomy and private use. Anyway a big applause to scanomat for this great product. I love it! The Scanomat Top Brewer provides speedy serving of coffee drinks such as: Espresso, Cappuccino, Café Latte, Americano, and traditional black coffee made from freshly grinded whole beans. Our Top Brewer offers both hot and cold milk. The Top Brewer also provides the crema that makes any coffee drink remarkable. The Scanomatic milk clean system flushes all hoses with clean water after each cup. The Top Brewer provides hot water for tea or chilled drinking water. The built-in steam function could be used for various purposes, for instance blanching of vegetables. This entry was posted in Allgemein and tagged top brewer. Bookmark the permalink.